The last thing you probably expected, today, was a post about how higher education is ruining the economy. After all, aren’t personal-finance bloggers supposed to be all about advancing yourself, spending wisely, and earning all that you can? Perhaps, but I’m of the personal belief that one can still advance yourself, spend wisely, and earn all that your worth without having to go to college. Before I get off on a tangent let me explain just what it is that I mean. Higher education has its place. If you want to be an engineer, a doctor, social worker, or even a teacher, you’ll likely need to have a college degree. For those professions that require a college degree there simply isn’t any other way around it. But, that doesn’t mean you need to go to a college whose tuition costs exceed several years worth of the expected salary for the profession that you wish to have. After all, the idea is to learn a profession so that we can earn more money, not learn a profession so that we can spend more money. Higher Student Loan Debt is Burdensome. How does all that relate to the economy? The effects of the high cost of tuition are far-reaching. The added debt of college loans can create a cyclical debt treadmill. A recently graduated student may have a small window of time to get his or her affairs in order, but is quickly saddled with a student loan payment. Newly minted professional usually work extra hours to make extra money to pay off the large student loans they’ve accumulated. The combination of less free time with higher debt repayment figures creates a vacuum whereby the money earned never gets a chance to enter into the economy. And everyone knows that the quickest way for money to enter into the economy is through consumer spending. Exaggerated Educational Requirements are Exaggerated. But, the added debt isn’t the only reason that higher education is ruining the economy. Heck, it isn’t even the student loan interest rates. Our economy has always had an informal hierarchical system. When I say that, I don’t mean that the people with the degrees got the better jobs, either. Not so very long ago, the people who got the better jobs were the people who were best suited to it. For many positions, that meant that the people getting the better jobs were the people with the most experience, and the most aptitude for the position. Somewhere along the way, the people in charge of hiring decided that a higher education degree could replace some level of experience. More and more companies decided that this was a good thing. And now, many job openings require that you have a degree of some sort. Real world experience in a position has been surpassed by classroom experience. Entry level jobs that could just as easily be done excellently by a person with a high-school diploma are suddenly closed off to anyone without a degree. Anyone that aspires to hold such a position is thereby required to attend college for a minimum of two years rather than spend those two years gaining experience and job skills for the position. Worse, for the economy anyways, is that that person is then effectively taken out of the economy for at least two more years. Instead of earning money, paying taxes, and contributing to the economy, that person is racking up the debt while taking so many credits that they can’t even afford the time to take on a part-time job. How do we fix higher education? I think, first and foremost, we need to stop pretending that a degree is a “requirement”. Stop pushing our children to attain a degree, and instead push them to get the minimal required training to attain the job/position that they desire. Kids will be kids and they’ll do what they please, but they shouldn’t feel like their being pushed into a college education because their parents want them to get one. We need to stop requiring degrees for positions that clearly don’t really need one. In my particular field (IT for those curious among you), very little of what I learned in college has been applied in my work experience. And yet, each of the positions I’ve had (with the exception of my most recent part-time job) has required a four year degree in the field. Let me tell you, anyone with an aptitude for IT, and a willingness to learn on the job could have easily fulfilled all of the duties that I performed. It’s a fact. How many other positions are there that are the same way? Lots and lots, I’d wager. From a strictly financial perspective, we have to do a better job of educating our children about how to go about getting a degree if that’s what they choose to do. There are numerous tools that can help us out, in this internet age. Our own government has a plethora of information to help, and there are plenty of other resources, like Big Future, that have lots of information too. We also have to properly express what a fiscally responsible adult should do. I can’t count the number of my fellow students (myself included) who took the maximum allowable student loans out, despite not needing that amount, so that they would have the extra funds available to do what they pleased with. Yes, it’s some of the cheapest money you will ever borrow, but unless you’re planning on investing in a guaranteed rate account while you attend college, it’s still debt. And every penny of it will make your financial life harder once you graduate. Finally, we have to stop this idea that we are all entitled to a college education. We aren’t. It’s a privilege that we pay grandly for. Just because you can spend $50,000 a year to get your library sciences degree, doesn’t mean you are entitled to, or should. Do you have a degree? Was it required for your position? Should it have been? How would you fix higher education? The back to school season is upon us, and many newly graduated high school students will head off to college for the first time. 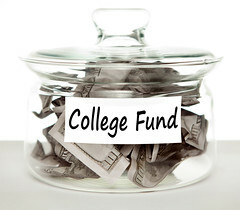 More than ever, college students feel financial pressure. The cost of college tuition continues to rise, and a student is often forced to decide to go into student loan debt to pay for her education or to work many hours to try to pay for the tuition without going into debt. As a former college teacher I have a few thoughts on the subject. If a student is going to college full-time, I cannot stress enough that school should be the main focus. If a student needs to work, he should work part-time, 10 to 20 hours a week. Yes, there are plenty of college graduates who brag that they worked full-time and went to school full-time and did just fine. Yet, what were their grades? I routinely had students in my class who worked full-time and went to school full-time. In this scenario, education almost always gets shortchanged. A student cannot neglect their employment, or they will be fired. Instead they neglect their school work and get low grades, often not even passing grades. A good rule of thumb is that for every hour in a credit course, plan to study three hours outside the class for a liberal arts class and four hours for a science or math class. That means a student taking a 3 credit hour rhetoric course should plan on spending 9 hours outside the classroom doing homework. If the student is taking a 4 hour anatomy class, he should plan on spending 16 hours outside the classroom on homework. A full load of classes can range anywhere from 12 to 18 credit hours. Those hours represent the time spent in the classroom. Even if all the classes are liberal arts classes, the student should still be putting in 36 to 54 hours on homework a week to obtain optimal grades. 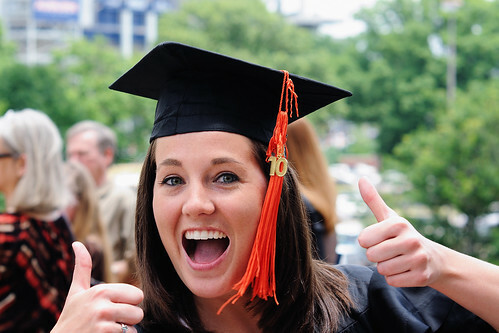 So, be sure to take your degree options into consideration when deciding on a job. Because, unless the student doesn’t plan on sleeping, working a full-time job is too much. There is nothing wrong with reversing the situation and working full-time to avoid taking on student loan debt. However, the student should only commit to taking a maximum of 2 classes a semester to obtain optimal grades. College students should accept that they can’t do it all. Either go to school full-time and work part-time and accept that you will have to pay off debt when you graduate or work full-time and go to school part-time and accept that you will graduate debt free, but it will take longer. If a student takes on too much and earns low or failing grades, they have ultimately just wasted their time AND money. For the past three years, I have participated in the ND Technology Occupations Student Loan Forgiveness program. The rules were pretty simple. You had to have a College Degree in a technology related field, and have a job in North Dakota in a technology related field. If you met the rules and got your application in before they ran out of money for the year, you got a $1000 student loan forgiveness payment on your student loans. Yippee! In those three years, I got the payment every time. They pay it directly to my loan and I now have $3000 less in student loans to pay for. Considering that I got away from college with a degree and only about $30,000 in loans, I’ll take a 10% reduction in principle. I’ve also got my interest locked in at a nice low 3.75%, so I can’t complain about my student loan situation. The one dim spot was that you could only claim the student loan forgiveness payment for three years and then you were done. Today, however, I got a letter in the mail from the North Dakota University System (the administrators of the program) telling me that the ND Legislature extended the program in the 2009 session. Yippee! But wait! There’s More! Not only did they extend it so you could claim it for four years, but they upped it from $1000 to $1500! WoooHooo! Oh, and they changed the name of it as well. Now it’s Science, Technology, Engineering and Mathematics Loan forgiveness program (S.T.E.M). All I’ve got to do is fill out some paperwork and send it in on time (May to June) and, if approved, they’ll pay $1500 of my student loan off for me. That’s another 5% of my original principle. For a total of 15% of the principle overall. I knew there was a reason I stayed in North Dakota! P.S. if you live here too (tell me) and you think you might meet the requirements, you can get information on the program at www.ndus.edu ; (Or you can click the STEM link in the next sentence.) click on Student & Parent Information and then Financial Aid. There’s a link there for the STEM program.